The Sony Pictures DVD is called CLIVE BARKER'S THE PLAGUE, though the film was neither directed, written by, or based on a story by Clive Barker. THE PLAGUE was actually directed by Hal Masonberg, who co-authored the script with Teal Minton; Barker was one of the film's producers. When producers take a possessory credit, it's almost always a bad sign -- a front-and-center billboard of territorial conflict -- but, in this case, Masonberg and Minton can take a measure of relief in letting Barker stand in the spotlight: the version of the movie bearing his name has received such virulent critical and public reaction that "it wasn't that bad" is the best comment I could find about it online. Normally, we could just forget the picture, along with so many other store-cluttering DTV titles... but in this case, it's not so easy. Word is coming out about the existence of a suppressed true creator's cut of THE PLAGUE that is supposedly far superior to the release version. 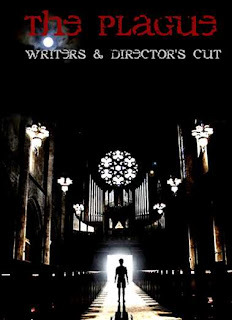 As an avid reader and fan of your site, I wanted to direct your attention to a site dedicated to getting the Writers & Director's Cut of THE PLAGUE released to DVD. In the fall of 2005, the film was taken away from its writers and director during post. After an 8 year struggle to get the film made, the footage was re-cut from scratch by the producers without the involvement of the film's creators. Stock footage was added, new dialogue recorded, and the film completely restructured. It was released to dvd in September of 2006 at a running time of 88 minutes under the title CLIVE BARKER'S THE PLAGUE, though it was not based on any of Barker's work (it was an original screenplay by director Hal Masonberg and co-writer Teal Minton) and Barker, personally, had very little to do with the making of the film. That version of the film in no way reflects the years of hard work, creativity, or artistic intent of the writers and director of the film. It is solely and completely a "producers' cut". I ask that you take a look at this site. On it you will find an hour-long documentary containing interviews with not only director, Hal Masonberg, but many others including Dee Wallace and other cast members, film authors/ journalists. There is also a link to a petition and much more info on what happened to this film. It is people like you and sites like yours that can make a world of difference to a film like this. All the difference, in fact. By making your readers aware of the existence of this site, we may be able to convince Screen Gems that there is an audience for this cut of the film and, perhaps, other films that have met a similar fate. Thanks in advance for your interest and we hope you enjoy. In short, the painful story laid out on the Spreading the Plague website -- which includes Masonberg being fired from the picture during its editing phase -- sounds pretty convincing to me. Whether or not a true creator's cut would yield a stronger PLAGUE or not, I can't say, but I do know that, in the history of such production interference, director's cuts usually prevail. However, in this case, such vindication is by no means assured. A director's cut exists only through Masonberg's independent, guerilla-like reconstruction of his and his co-author's original intentions, made at home from digital dailies after being barred from the editing room. It would seem that his cut therefore made use of materials that were not his legal property, and now Masonberg finds himself in the awkward position of trying to interest Screen Gems in releasing a product that was made in spite of Clive Barker's company, and in spite of them. I know it's hard to work up any interest for a movie that badly disappointed you on the first pass, but if you're passionate about creator's rights, you may find the revelations of the Spreading the Plague website to your interest. You can find it here.